This scenic destination, one of the most dramatic locations in all North America, boasts glistening waterfalls, glaciers and mountains. Located 50 miles southeast of Juneau, this spectacular glacier-carved fjord has sheer vertical walls that clearly showcase nature's artistry. Linger in this magical place to watch blocks of ice calving off the glaciers towering faces. Sawyer Glaciers - Alaska's brilliant blue glaciers are constantly crumbling and yet their powerful effect is never diminished. 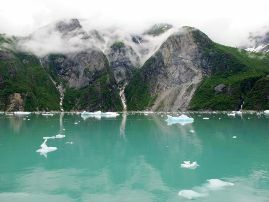 Witness the white thunder as the Sawyer Glaciers release into the waters of Tracy Arm Fjord. When you go on an Alaskan Cruise of 7 nights or more, this will invariably include at least one Glacier. In our humble opinion, Tracy Arm is one of the most spectacular!